A mystery is afoot in Japan, where a minimum of four boats (some containing dead bodies) have washed ashore. While authorities haven’t confirmed their origin, signs suggest they are from North Korea. 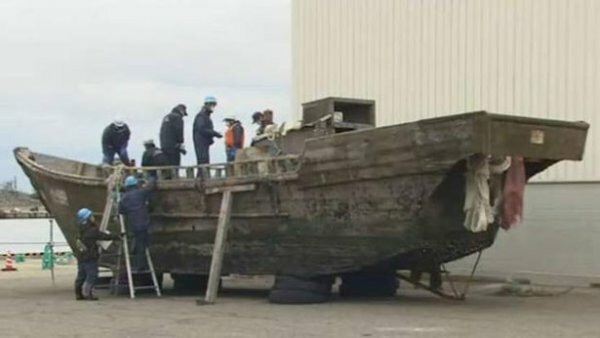 One of the boats was found on Miyazawa beach, located in the northwest of Japan’s main island Honshu. According to the Akita Coast Guard, eight skeletons were found in its hull. Last Friday, the unidentified boat was spotted drifting toward shore. The grim discovery was made shortly after. Officials believe the boats are from North Korea, as they match a collection of vessels and debris that have made their way to Japan’s west coast. According to Satoru Miyamoto, a professor at Seigakuin University, ships tied to North Korea have been washing ashore in Japan as early as 2013. The four boats washed ashore on November 15, 17, 23 and 27. Three dead bodies were found in the first, and they — along with survivors — were returned to North Korea. But two days later, the Coast Guard found four more dead bodies on another boat; it had washed ashore in the same area. A few days after that, eight North Koreans were rescued after their boat ended up in Akita prefecture. And just four days later, eight skeletons were discovered. This isn’t the first time a collection of battered ships have washed ashore in Japan. In 2015, more than 12 “ghost ships” were discovered with dead bodies aboard. At that time, experts theorized that the bodies were likely refugees or fishermen. They figured that the crew ventured into dangerous waters out of desperation — perhaps to escape North Korea and its limited rations. However, there’s more to digest. In recent months, a soldier made a dramatic break across the demilitarized zone in his escape from North Korea. When he was checked into a hospital, doctors found a large number and multiple forms of parasitic worms. Some were even as long as 27 centimeters (more than 10 inches)! The soldier was also infected with hepatitis B. Some experts now believe his condition is indicative of why so many people are attempting to flee North Korea. According to Choi Min-ho, a professor at Seoul National University College of Medicine, the use of human fertilizer on crops and poor sanitary conditions has likely resulted in the transmission of parasitic cysts. Though it is close to impossible to confirm what or what is not going on in North Korea, it seems clear a hefty fraction of the population is unhappy. North Korean defector and former army officer Kong Ri Hyuk confirmed this when he told CNN that the conditions in his home were “brutal” before he escaped four years ago. As CNN reports, North Korea suffered an intense famine in the 1990’s, which killed as many as 1 million people. The UN now estimates that as much as 70 percent of the nation’s 25 million people still don’t eat balanced, healthy diets.
? 15 Quotes From “The Prophet” Kahili Gibran That Will Teach Us About Self Love $30 Million Contract Canceled By FEMA After Supplies For Puerto Rico Fail To Arrive ?